Happy Thursday and St. Patrick's Day dolls! Only one more day until the weekend, I can't wait! I'm going out for a low key St. Patrick's Day celebration tonight so I'm definitely glad tomorrow is Friday. I don't know how it's possible but I was more tired Wednesday morning than I was Monday morning and today I have 4 hours worth of meetings so it's going to be a long day! While I might not be wearing green on the blog today, trust me, I'm wearing green in real life! No pinching for this girl! Ok, now on to this outfit. I haven't shopped at Loft in probably like 5 years. Ok maybe more... *insert embarrassed emoji face here* but it was just never a store I thought to stop in on the rare occasions I was in the mall and it never even crossed my mind online until I started seeing so many cute outfits from other bloggers all coming from Loft. Jenn had posted some super cute things from Loft fairly recently and I saw this exact top on another blogger on Instagram and that convinced me I need to check it out again. Of course I found several things that I needed in my closet immediately and while Loft can be kinda pricey, if you hit them during a sale time it's definitely worth it. And what do you know? I happened to be checking them out on Leap Day so they were offering 29% off you entire order! (Of course now it's an extra 40% but whatever...) so I scooped up this fun mixed material peplum top and rocked it to work on a Friday then out to happy hour. To keep things simple (just the way I like them!) I paired it with a pair of comfy jeggings and quite possibly my new favorite heels! Seriously, these things are so comfortable and cute and look exactly like a pair of Steven Madden's I wanted but for a fraction of the cost! I walked all over downtown (3.71 miles to be exact) and my feet weren't bothering me at all! I topped off my look with some layered necklaces and a pop of color with my favorite watch! Hope everyone has a fantastic day! I love that top! It looks great with those shoes too. I probably have more black tops in my closet over anything else x10...it just goes with everything! Happy St. Patrick's Day! Your top is super cute! Love everything about this look! I really really love those heels! Sometimes I get so lucky in Loft and sometimes I don't but that peplum tops is super adorable... if you are looking for more, ON has some really cutes ones right now, and of course, you can't beat their pricing. I’ve been really impressed with Loft lately! Such cute pieces and they always have great sales! Your top is super cute! Love the top, and the whole outfit! I didn't start shopping at Loft until last fall, but I've found some really great pieces. Like you said, if you wait for sales you can make out really well! Love that top and the watch is pretty awesome as well! I'm so impressed that you got so much pain-free walking out of those shoes! Good luck with your meetings today! I love that top! & I love that it came from Loft & that it's 40% off right now... time to shop! glad you stopped in! i love the peplum. happy st pats to you as well! Love this outfit! especially love camel and black together. one of my fav combos lately - and don't get me started on those shoes. THE best :) target does it again! see you later - in green! 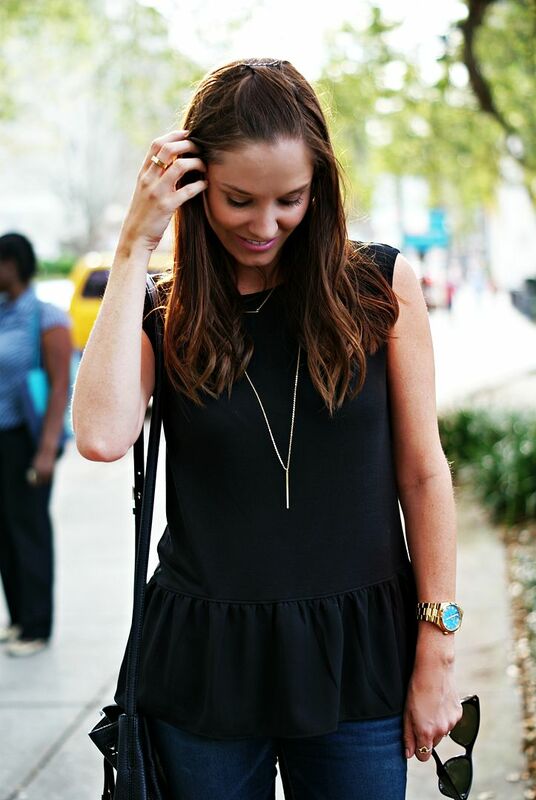 I love love love peplum...and black-YES PLEASE. This looks great on you! I just got this exact same top 2 weeks ago!! Loft is my go-to store for all my work clothes! Have to make sure you shop during a sale though! Super cute outfit, lady! 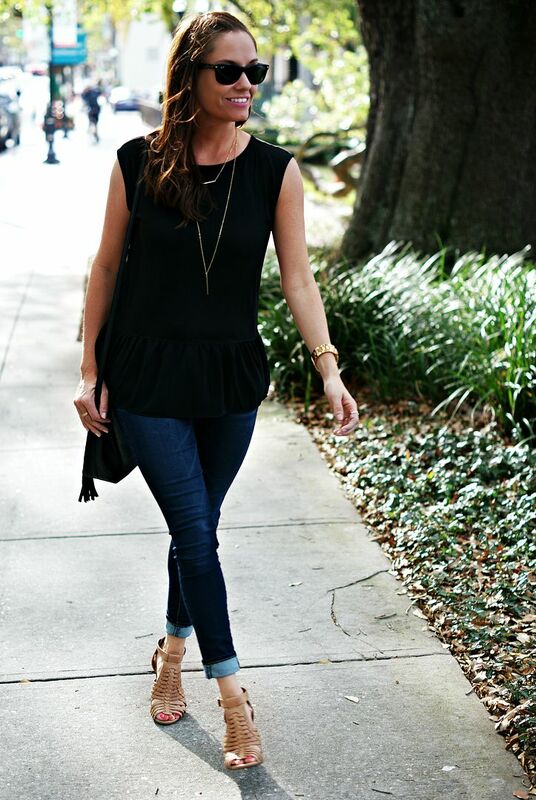 Love the casual peplum. LOVE that top! I hadn't been in a Loft in years and started shopping there again last year. They're like a totally different store than they used to be! That shirt is so cute and I am going to add it to my cart immediately! Such a cute top, you can't beat the peplum! Love it paired with these fabulous neutral sandals, too! So adorable! Loving this peplum! And those sandals are so fab! I need! Love this entire outfit! I'm even more into those shoes now that you mention how comfortable they are! Seriously I am dying over this chic little outfit!!! You look so street ready and just so chic! love! That top is so cute. I haven't been to loft in ages as well, it used to be my favorite store, need to go back. I LOVE the Loft! One of my favorite stores ever but yes, always gotta' wait for that good sale to roll around. I've been holding onto a giftcard for them for months now lol- I can't decide if I should buy maternity clothes or hold off longer for a post-baby shopping spree!! I love Loft so much, and end up wearing their stuff to work all the time. Their sales are always amazing, so I always try to wait for one before I make a big purchase! I love the little pops of turquoise :) This shirt is too cute! Love this! I am a huge peplum fan: love them alone, under a blazer, or as a dress. This is perfect! I love this classic top! Also, love the pop of color that your watch brings to this look! I love this flounced hem top! So simple yet so gorgeous too! Simply beautiful! like your cute top! Great look! 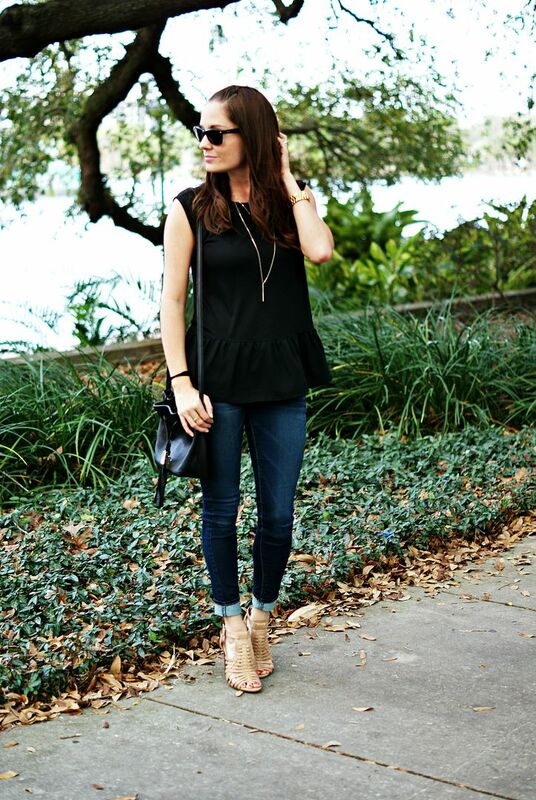 I love the peplum top and it looks great with jeans. I love your outfit!! That top is perfection! Have a great weekend pretty lady! This is such a nice outfit, girlie! I love the causal vibes, yet it still looks dressed up and put together. I can't help but focus in on that gorgeous watch! I love the aqua face, perfect for spring and summer! Thanks so much for sharing and I hope you have a wonderful weekend ahead, beauty! 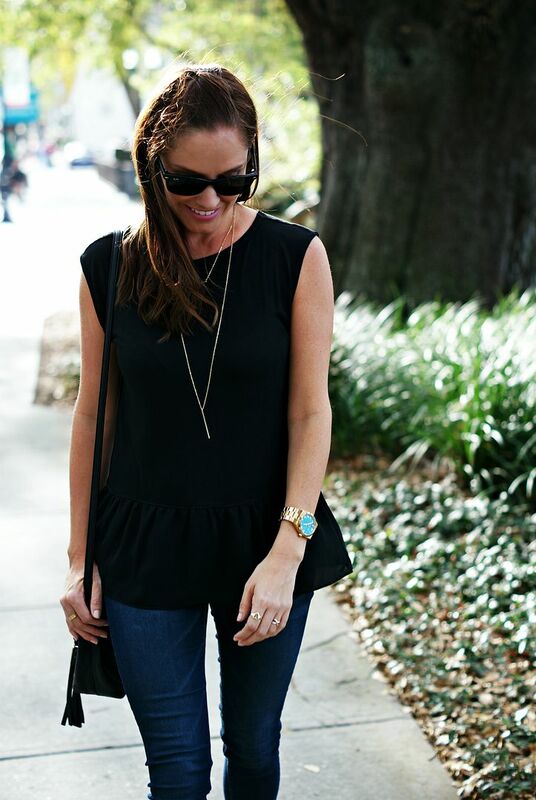 Peplum tops are my absolute favorite! Love how you styled this one! Girl, I'm with you about Loft - I hadn't been in there until I was at the outlet a couple weeks ago, and I was amazed at how much cute stuff there was! This top is adorable on you, and I love those heels! I love the look. Its casual yet chic! this outfit is so adorable! the peplum looks fabulous on you. i love/hate Loft. a lot of their clothes are super cute for work, but they are so overpriced sometimes, and i hate the shipping minimum, makes me over shop haha (exactly what they want!) but yeah you can't go wrong when they have a sale!